Pearl Duncan, a New York author, was granted her noble ancestors’ coat of arms in 2005. She is completing a book about using DNA and genealogy to search for ancestors, and one about the identity of the eighteenth-century merchant cargo ship discovered in the summer of 2010 in the foundations of the World Trade Center. Contemporary artist's depiction of African slaves in Virginia, 1670. Since I am completing a book about the ancestry of my blended ancestors from America, Africa and Europe, I was intrigued by the announcement about President Barack Obama’s mother’s American ancestry. So I pause to make one small correction in that story. I am also completing a manuscript about the colonial merchant cargo ship discovered a few summers ago in the foundations of the World Trade Center, so stories of lost, blended colonial ancestors are still vivid in my memory. So recently, when researchers at Ancestry.com announced that they discovered genealogical records, which suggest that President Barack Obama’s white American mother is descended from America’s “first slave,” John Punch, and genetic markers in the Bunch family, his mother’s white male ancestors, the descendants of John Bunch, show DNA markers from Cameroon, West Central Africa, I wanted to know if geneticists were able to establish a timeline for this white American family’s African DNA. Does their African DNA indicate ancient or medieval markers, or DNA from the colonial American era? And will geneticists be able to establish this genetic timeline, or is the information, lost, buried in the limitations of genetic research? A notable part of the researchers’ report said the enslaved black John Punch had children with a free white woman. Then, because the mother was free, Punch's mixed-race children were born free, and generations of the Punch family later became prominent land owners in Virginia. But the Ancestry.com researchers said John Punch was “the first slave in the colonies.” Africans who were chattel slaves were enslaved for life in the colonies were distinguished from indentured slaves, who were (often voluntarily) enslaved to work for a few years. But the researchers’ use of the word "first" caused me to wonder how much documentary evidence should be expected in researching genealogy and history that are difficult to trace, because of the racial attitudes and scant records from the colonial era. One of the problems with the announcement this week is the researchers said "first slave in the United States," meaning the thirteen English colonies on the East Coast, but should have said the thirteen colonies or North American colonies, because some of the media, picking up on the story, simply wrote the “colonies.” Researchers should have identified the “colonies,” because the date they named for the first slave -- 1640, when John Punch was sentenced to a lifetime of perpetual slavery in Virginia -- was hundreds of years after African slavery began in the Americas. By 1640, other African slaves were enchained in chattel slavery in the Spanish, Portuguese, and English colonies in the Carribbean and South America. 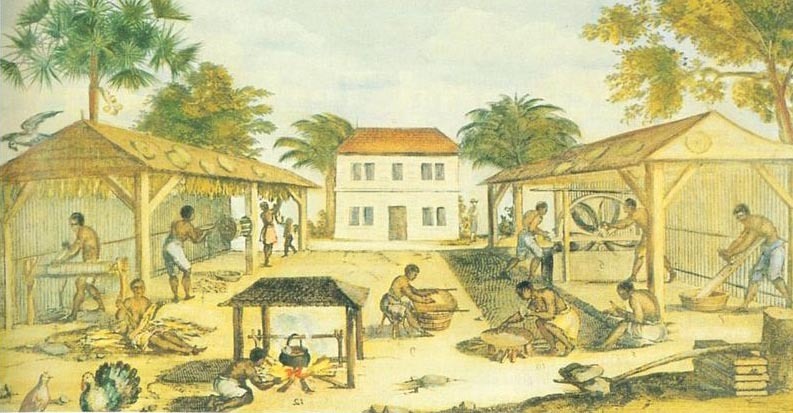 In the Spanish Caribbean colonies, some of which later became English and later British colonies (the Acts of Union between the English and Scottish kingdoms were not passed until 1707, and so it is technically anachronistic to refer to British colonies before 1707), native peoples perished readily as slaves. Hence, Spanish King Ferdinand II, he who sponsored Columbus's voyage to the New World, declared that colonists in the American sugar trade should import African slaves who had already been traded by the Portuguese to Spain. The year was 1501. Four years later, Ferdinand shipped seventeen African slaves to work in the copper mines in Hispaniola (present-day Haiti and the Dominican Republic). A few months later he sent an additional hundred. In 1510, fifty more slaves were dispatched. In 1517, the Spanish crown issued a contract for 4,000 slaves over eight years. In 1535, Queen Joanna signed an order for another 4,000 slaves -- fifteen hundred going to Hispaniola, five hundred to Puerto Rico, three hundred to Cuba, and another three hundred to Jamaica. By 1540, 30,000 African slaves had been sent to the European colonies in the Carribean, and more than 100,000 were shipped to all of the Americas. There was a Spanish colony established in 1526 in South Carolina, San Miguel de Gualdape, built in today’s South Carolina (possibly Georgia -- the exact location remains obscured) by African slave labor. The colony was abandoned the following year after a slave revolt. Another, more permanent colony was established in Florida in 1565 -- Saint Augustine. So, when the burgesses who ruled the Virginia colony sentenced John Punch to indentured servitude in perpetuity, they sentenced him to a form of chattel slavery that already existed in the New World -- even in what would become the United States. He was not the first slave in America -- merely the first slave owned by the English.